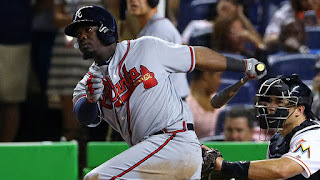 On the ropes early, and in danger of extending their season-opening losing streak even further, the Braves showed resolve and rallied behind three RBIs from Adonis Garcia, including a tiebreaking two-run single in the eighth inning, to defeat the Marlins, 6-3, on Friday at Marlins Park. Garcia, who committed two errors in the third inning, became the Braves' offensive hero late with his key hits, which enabled Atlanta to avoid dropping to 0-10 for the first time since 1988. The Marlins, meanwhile, let a three-run lead slip away. They had the chance to break the game open early but bounced into three double plays, and fell to 12-26 all-time against Atlanta at Marlins Park. Marlins lefty Wei-Yin Chen, going 10 days between starts due to a bruised left elbow, gave Miami a terrific start. He faced the minimum for 6 1/3 innings as the Marlins built their three-run lead. But with one out in the seventh, Atlanta started its comeback. Daniel Castro andFreddie Freeman had back-to-back singles, and Garcia dropped an opposite-field RBI double. Chen was lifted for David Phelps, who induced an RBI groundout from Gordon Beckham. Phelps then struck out pinch-hitter Kelly Johnson. In the eighth inning, Nick Markakis had a game-tying single off Chris Narveson, who loaded the bases with two outs by hitting Freeman with a pitch. Bryan Morris entered and surrendered the two-run single to Garcia and an RBI single to Beckham. Pushing buttons: Braves manager Fredi Gonzalez pushed all the right buttons in a four-run eighth inning. Down 3-2, pinch-runner Mallex Smith stole second and scored the tying run courtesy of Markakis, who was moved to the leadoff spot for this game. Pinch-hitter A.J. Pierzynski was hit by a pitch and scored the go-ahead run on Garcia's hit. Chen's no-no bid: When Chen walked Markakis on four pitches to start the game, it looked like it could be a wild night for the left-hander. But Chen induced a 6-4-3 double play, and retired Freeman on a grounder to short. The lefty retired 12 straight and held Atlanta hitless until Beckham's one-out single in the fifth. The next batter, Jeff Francoeur, bounced into a 5-4-3 double play. Chen, however, settled for a no-decision. Double-play trouble for Miami: The Marlins were all over Braves starter Williams Perezearly, collecting eight hits and two walks off the right-hander in 4 1/3 innings. But they managed just three runs, the third coming on Martin Prado's RBI double. But Prado bounced into two double plays, in the first off Perez and in the seventh inning against Alexi Ogando. Christian Yelich also tapped into a 4-6-3 double play in the third inning off Perez. The Marlins have not had a pitcher turn in a complete game since Henderson Alvarez on June 3, 2014, against Tampa Bay. Chen was at 69 pitches through six innings and looked like he might have a chance to go the distance, but he was lifted with one out in the seventh inning. Miami has now gone 274 straight games without a starter going the distance. Braves: Bud Norris gets the start on Saturday in the second of a three-game series at Marlins Park. First pitch is set for 7:10 p.m. ET. Norris has dropped his first two decisions this season, both to Washington. He looks to improve on a 6.00 ERA over 12 innings this season. Marlins: Tom Koehler comes off a tough loss at Washington, where he gave up two runs in 6 1/3 innings, to take on the Braves Saturday. The right-hander has faced Atlanta 14 times, with 10 starts, and he's 2-4 with a 3.36 ERA in 67 innings.